There’s usually not that much thought going into acquiring a cheap travel guitar, an item commonly seen as an inexpensive piece that we are willing to put through a punishing regime on the road. This short guide is meant to meet just the needs of the unconcerned or time-strapped shopper — with a brief selection of some of the top picks in the field. But even so, the best travel guitar is not to be underestimated, as some models, like the Traveler Guitar SPD HRB V2, are designed to perform as close to their full-sized counterparts as possible. And the SPD HRB V2 does this while substantially cutting in size by placing the tuning system inside the body, which eliminates the headstock while keeping the scale regular length for better playing performance. If you prefer a silent electric guitar that can be used in the same way as an acoustic for gigs, then the Yamaha SLG200NW should prove a good choice. 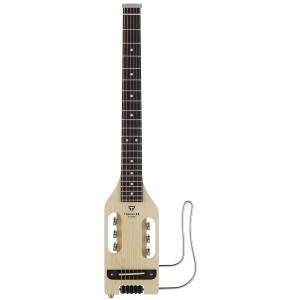 This travel guitar is perfectly sized to be transported without much trouble. It weighs roughly 4 lbs and fits in most airline overhead bins, making it perfect for concerts abroad when you want to make sure your gear doesn’t get lost on the way. A deluxe bag is included, to help provide a safe environment for the instrument during your trips. The built-in headphone amp of this item has four tones. When you use it with headphones, you might hear a faint hissing sound which some users find displeasing. 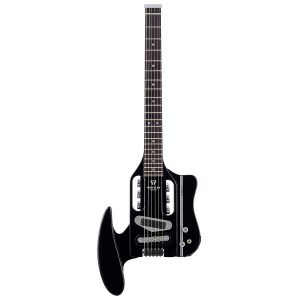 Aside from ease of transport, this guitar will also offer you the possibility of excellent performance. 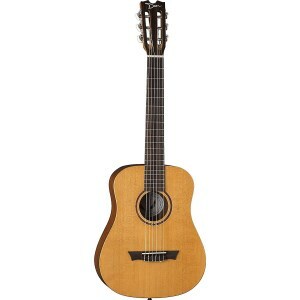 More suitable for classical players because given that it features nylon strings with regular spacing, this guitar delivers a near-silent performance that is great for practicing in public spaces, which is the case with many musicians that travel a lot. You can use it as a substitute for an acoustic guitar given that its pickup system has a very natural feel to it, almost like the original alternative. This particular option is not suited for the needs of a beginner, and that might be discouraging. Jamming will become easy when you’re using this option that’s always ready for setting off on a trip. Made using mahogany back and sides combined with a top that features solid spruce for increased durability, this guitar is a miniature version that will weigh less than the original size and still produce an impressive sound. It has a smooth satin finish that adds a bit of style and comes with a custom string set, already tuned to A. The packaging includes a custom gig bag. The strings included might not last as long as expected, according to some customers. Unlike the usual fractional size guitar, this one has a full-width neck so your performance won’t be affected. We’ve looked through a number of travel guitar reviews and made a selection of the best-appreciated products out there, so you won’t have to churn through literally hundreds of items when browsing for a travel guitar for sale. The aptly named Traveler Guitar brand is widely appreciated for delivering some of the best items of these type out there, and the compact SPD HRB V2 is no exception. It comes with everything you need to practice or jam on the road, like a headphones line with a 4-tune preset amp and an aux-in for an external signal so you can jam alongside your favorite bits of music. Of course, this is all neatly packaged in a ¾ sized instrument, that fits neatly in the overhead compartment of a medium-sized airliner (thin Boeing 737-300 or Airbus A 300), so you’ll be able to bring your guitar along while flying with a budget airline. This doesn’t come at the expense of the tonal range, however, as the V2 has a regular-sized scale, which should allow for the same possibilities as a larger guitar. This has been achieved by eliminating the headstock and placing the tuning keys in the guitar’s body. Speaking of which, the V2 has been designed with ergonomy in mind and should be comfortable to use even by taller players. The Japanese manufacturer needs no introduction and some of the advanced technology they are famous for can be found in the new SLG200NW. First, there’s the patented SRT-powered pick-up system, which should give this silent electric guitar a natural acoustic tone, reminiscent of what you will get with a classic instrument. Besides offering clear and crisp tones, the SLG is 80% quieter than your standard acoustic guitar, which means you will be able to practice just about anywhere without bothering others. To further facilitate this, it also comes with a pair of headphones in, but if you want to use it for a gig, you can connect to an amp via the line-in plug. 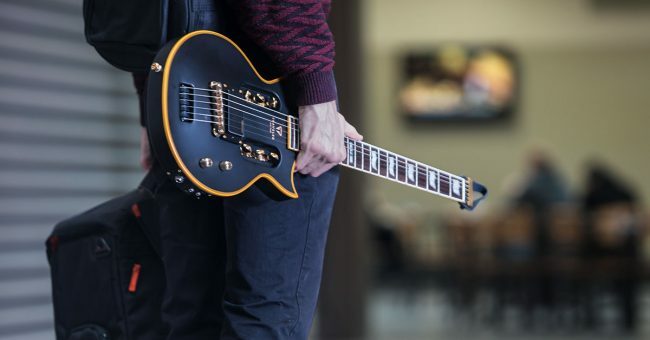 There’s no other way to put it, but this compact guitar just looks cool, with a hollow body that follows the classical shape you are used to around the edges. However, you’ll have to fork over some fair dollar if you want to buy it since this Yamaha isn’t exactly cheap. The Cordoba Mini M is a more budget-friendly solution (but not the friendliest on our list! 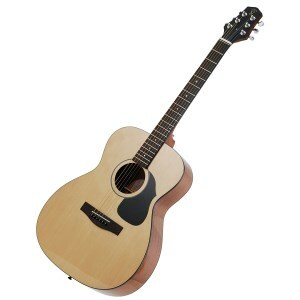 ), and it boasts sounding as close to a regular acoustic guitar as possible. Of course, this is a ¾ sized instrument, with a 20” scale and a 50” nut width, which means it will be easy to fit in the trunk of your car or in the overhead compartment of an airliner. 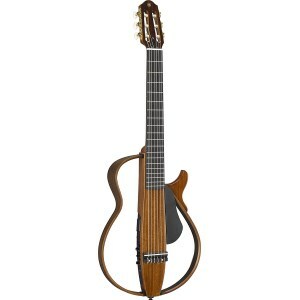 It also comes with a set of custom Aquila nylon strings, and it’s been pre-tuned to A. This should satisfy even those who are prissy about having the right strings, and would spare them from acquiring a quality set after purchasing the guitar, as many of these people do. People who’ve played it report that the tune is as sweet as you would expect from nylon strings and that it offers a remarkably high volume, which should make it a workable stage instrument. The top is made of spruce, which should give it good direct tone, while the rest of the body is mahogany. With a 24-inch neck, this Steel String Backpacker offers a slightly higher range than your typical traveling guitar. This won’t make it in any way cumbersome, however, as it’s small enough to fit the overhead luggage compartment in an airplane. It is also reported to be quite durable, so there shouldn’t be any hang-ups about taking it camping or playing it on a bus, where it might fall and break. Due in part to this, it should also make a great beginner’s guitar, especially as it is remarkably easy to tune. People who’ve bought had only good things to say about its sound quality, which is fairly close to a regular-sized instrument. Like with most other guitars, the top is made of spruce while the rest is mainly mahogany, which should give good sound projection to the metal strings. The unique shape of its body may or may not fit your preferences, but it’s certainly compact, making it comfortable to hold for smaller players. What makes this Transit Series model stand out among items on our list is the fact that it can be folded. The premiere advantage to be seen from this is that it allows for a regular-sized 25.5-inches scale to be used, allowing for a full range of sound. With a solid spruce top that should give you good volume and projection, this acoustic guitar is a delight for all fingerstyle fans. Again, there are no complaints about the sound quality and people who purchased it seem to really appreciate it as an instrument to sing around a campfire. It will, of course, fit the overhead compartment — even on smaller planes — and it comes with a very well appreciated double-layered carry bag. The only item of complaint one might find about it is its price, which is not exactly on the cheap side, but this is somewhat made up for by the fact that it sounds as well as a more expensive item. 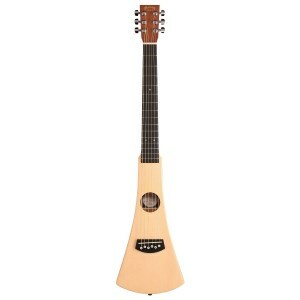 This compact piece from Traveler Guitar is an electric-acoustic, which means it can be used both free-hand and with an amp. It is exceptionally quiet without amplification which makes it well suited to being played on the road, without bothering fellow passengers. There’s also a headphones line for those who prefer to practice with an amp. Like other models from the same manufacturer, the tuning keys had been moved to the body, so this guitar is significantly more compact than other instruments with the same scale length. Of course, the scale is a full 24 ¾ inches, which should allow for a wide range of sound. The body is mostly maple, with ebonized rosewood being used for the scale, and only weighs in at 2 pounds 14 ounces, which should make it very comfortable to carry for a long time. It also comes with its soft own gig bag, and it takes up very little space when packed. This Dean model is a pretty basic acoustic guitar, cut down to ¾ of size to make it more portable for traveling. 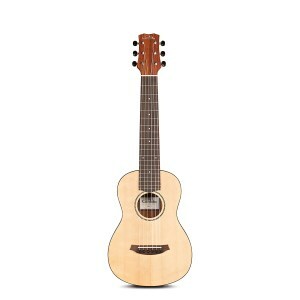 It has a 22-inch scale, which should be enough for a wide range of sound, and there is a choice for the top material between mahogany and spruce. The rest of the body is made out of mahogany, while rosewood had been used for the fretboard and bridge to give it extra durability. 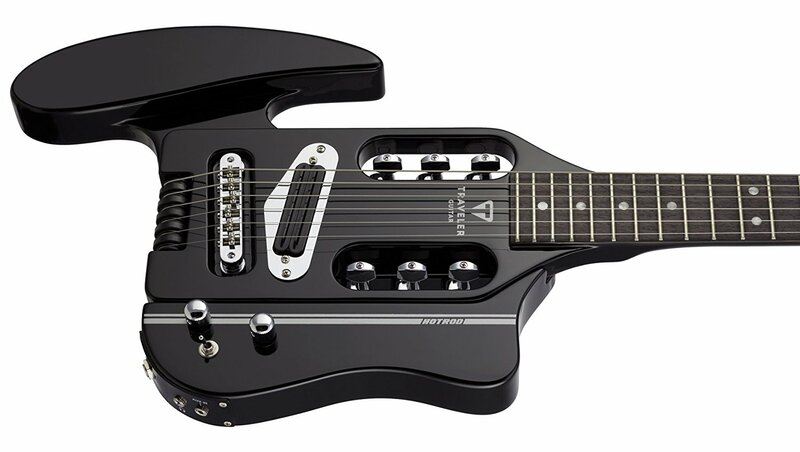 It has a classic look, so those that like the traditional shape of a guitar should appreciate it. The metal hardware is chromed, to give it better rust protection while the strings are nylon so it should give out a crystalline sound. You shouldn’t worry about it sounding more like a uke, however, as people who’ve used say that it’s acceptably close to a regular-sized guitar. On top of that, this guitar is pretty inexpensive, which makes it a pretty good pick for beginners or as a secondary guitar for experienced players. If you’re asking yourself “what is the best travel guitar?” you first need to know what exactly makes one of these items good in order to reach an answer. Like any musical instrument, it needs to sound well, or at least sound good to us, to fit our preferences when it comes to things like tune or pitch. Other than that, it obviously needs to be rugged for life on the road or at least cheap enough to be expendable. Size is one of the first factors to consider, and arguably the defining feature of a travel guitar, so it’s only natural to start our analysis of this type of item by considering size, and anything that goes with it. 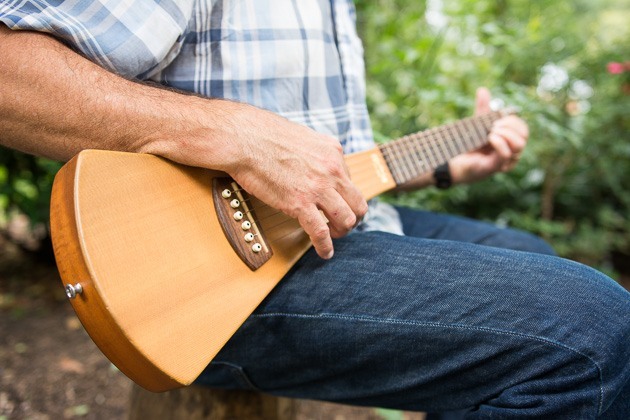 Travel guitars are generally designed to be ¾ of a typical instrument so that they take less space in the car or will fit the overhead luggage compartment of an airliner. This last bit is especially important, as handlers working in airports aren’t exactly known to be kind to your baggage. Overall length and volume are cut down by making the top more compact, and by shortening the case. The first thing is especially easy to achieve when full-bodied (the top is one solid piece) electric guitars are concerned but might lead to some loss in resonance with hollow top acoustic or acoustic-electric instruments. However, what most people seem to find to be a drawback in compact guitars is the loss of range that a shorter scale entails. This is circumvented by some manufacturers by simply leaving the neck full-length and accounting for the ¾ size in some other manner. The headstock might be excluded, or the body might end abruptly at the bridge. A less serious issue that some people have with reduced size is that these instruments aren’t exactly “cool” since children tend to use them when they first start playing. In the same vein, a taller guitarist might feel himself looking awkward when wielding an undersized piece. The type of wood a guitar is made of is considered to be the most important factor determining how it will sound. This is obviously the case with acoustic pieces, but despite the popular misconception, the best electric travel guitar for fingerstyle will have to resonate with the body as well, so that the notes hit by the player get transmitted to the audience as clearly as possible. The most important part when it comes to creating resonance is considered to be the guitar’s top. Other parts of its body might be made from different material, but the wood used for building this will affect the instrument’s sound characteristics the most. Probably the most commonly used essence out there is Spruce, more exactly of the Stika species. This is a relatively light but hard essence, which allows for a very thin top, good for directing high-velocity sound. It also has a powerful direct tone, that keeps its clarity when played forcefully. Cedar offers a balanced, warm sound and is a favorite for fingerstyle player due to its prompt response. Mahogany sits at the polar opposite when it comes to response time, but it puts out a dense sound and low overtone. These are favored by country blues players. Maple offers a low response rate as well, and tends to be more acoustically transparent which means that the top will be heard without too much tonal coloration. Rosewood has a high response rate and a broad range of overtones, which makes it good for hard rock and metal players. Whichever you might prefer, the best sounding travel guitar won’t be easy to live with if the manufacturer didn’t consider its daily use and included features accordingly. It’s especially important that the traveling guitar is easy to tune as you’ll be doing this quite a lot. Wooden models can lose shape due to humidity and temperature differentials and might need tuning before each gig. Another very important issue to account for is the pressure difference your instrument will be subjected to during airline travel. The strings must always be loosened before boarding a plane. Otherwise, the guitar might snap at the joint. Speaking of which, the place where the scale and body meet is an exceptionally important part of the instrument. Take care that it looks solid before buying! Are travel guitars any good? Travel guitars can vary in quality pretty widely, and the best among them can effectively rival regular-sized pieces. These would make a good choice for stage players, but the added cost might not be justifiable for an amateur that only needs it to sing with friends. Their most important quality is their portability, allowed for by a significant reduction in size. This makes them have a smaller tonal range relative to full-sized models, but this isn’t universally true, as some manufacturers chose to design their guitars with a regular-length scale. Is getting a second-hand travel guitar risky? It can be pretty risky purchasing a second-hand guitar if you don’t have the opportunity to test the instrument beforehand. As a general rule, you shouldn’t buy used guitars unless you can thoroughly inspect it before handing in the money to the previous owner. Second-hand beginner guitars are to be avoided, as inexperienced players can put their instruments through quite a deal of punishment and the $100 – $200 price difference might not be worth the hassle. After all, new beginner guitars aren’t that expensive anyway. Can you take your travel guitar on a plane? Yes, this is one of the main advantages they offer, in fact. If the airline personnel claims otherwise, remind them that it’s the law for you to be able to hang on to your instrument. According to the “FAA Modernization and Reform Act of 2012” with reference to small instruments as luggage, any passenger is allowed to carry a guitar, a violin, or any other musical instrument in the aircraft cabin without being charged an extra fee aside from the standard one. What this means is that you should pay for keeping your guitar in the cabin just as much you’d have to pay for a typical carry-on luggage of similar weight and size.